Imagine yourself in a clothing store. You see a shirt that you really like in the sale section, however, you would like it more if it was in white instead of red. It turns out the store does have that shirt in white. In order to get to that shirt, you would need to spend a couple minutes to walk to the second floor and find it in the women’s clothing section. Wouldn’t it be a lot easier for you if every color of that shirt is next to each other but with different price tags instead? 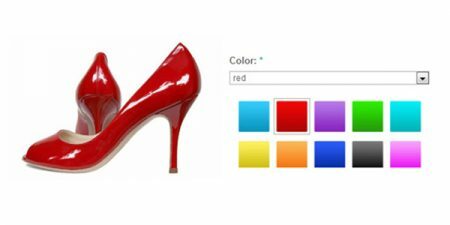 If your E-Commerce or E-Catalog website carries products that come in different colors, your visitors would feel the same way you do in the scenario above if your website does not have the color swatch feature. Aside from improving the user experience, color swatches can also improve conversion rates because it decreases the number of clicks for visitors to find the information that they want. According to Jeffrey Zeldman’s “Three-Click Rule”, the suggested number of clicks it takes to navigate and search for information on a website is no more than three mouse clicks. In the case of an E-Commerce site, color swatch on the product page can greatly increase the chance of finding the most desired product that a customer wants with substantially less clicks. E-Commerce platforms like Magento have several different color swatch extensions that you can use to integrate into your website. Contact us and ask us how you can integrate color swatches for your e-commerce website today!